Good Afternoon Happy Stampers!! Cynthia here and I'm back for another fun day of projects. 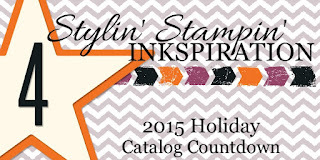 Today is the second day of our 2015 Holiday Catalog Countdown with the designers at Stylin' Stampin' INKspiration! As you know, Stampin' UP! is releasing the 2015 Holiday Catalog on September 1st. HOW EXCITING IS THAT!! For this countdown we are going to take a seasonal approach to help get you in the holiday spirit!